Ever been to Seattle? No? You are missing out. Great scenery, the Space Needle, greenery, lots of asian influence and crappy weather. If you don't mind gray skies, Seattle should be on your list of places to visit. Oh yeah, they have a pretty cool ballpark too. I used to love sushi. Delicious raw fish wrapped in veggies and rice. These days, I only eat the so-called California roll; all veggies and no fish. Why? Have you ever seen raw fish under a microscope? If you have, you probably don't eat it either. Trust me on this. 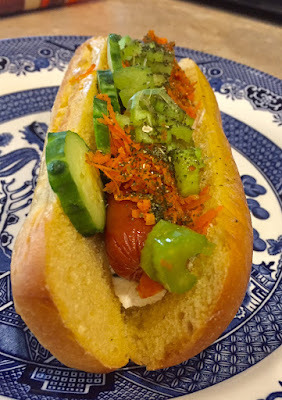 With a bustling asian influence, I offer Seattle Mariners fans the Sushi Dog. It starts with a toasted bun, fill the bottom with a layer of cream cheese (this is a nod to the famous Seattle Dog, which is nearly as renown as the Chicago Dog), put in a Hebrew National frank (I would use raw fish, but see above), lay a row of sliced cucumber on one side, shredded carrots down the middle, diced celery on the other side, pour on a small amount of soy sauce, and the sprinkle on kelp granules. There you have a dog that tastes like a huge sushi roll, minus the raw fish (you did look up what crawls on raw fish didn't you?). This is the perfect dog to watch a Mariners game on TV. If you are in Seattle, SafeCo Field has some of the best eats in the league. But since this is a virtual baseball tour, become one with the couch and watch the Mariners toss the horsehide around. 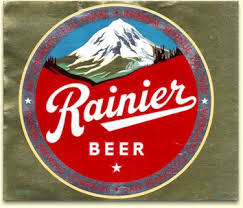 Beer pairing: Rainier Beer has been a Seattle favorite for decades. With catchy commercials and a crisp and affordable beer, it is the perfect locally produced suds with help your Sushi Dog slide down your gullet. When I was in the Navy, I heard some ships were making a port visit to Baltimore. Baltimore? I didn't grow up that far away, but I had to look at a map to realize Baltimore indeed has a harbor and access to the ocean. Then I realized that the Star Spangled Banner was written about the bombardment of Fort McHenry which is basically in Baltimore. Moral of the story: Baltimore has a close relationship with the ocean. How close? Maryland crab is world renown and you can't swing an oriole without finding a place that serves up authentic Maryland crab cakes. And take it from me, they are delicious. Any hot dog that honors the Baltimore has to include crab and somehow give the city's close proximity to the ocean a nod. Therefore, allow me to introduce: The Sponge Bob. 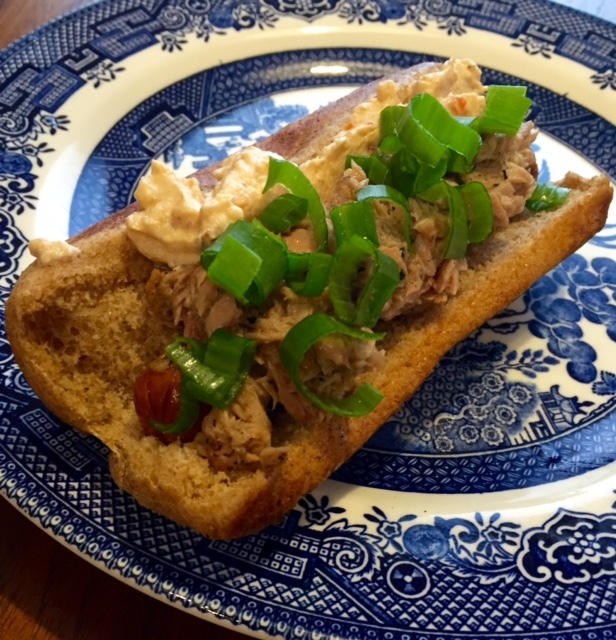 A hot dog that mixes beef and seafood that taste awesome while watching an Orioles game. Start by toasting a regular bun in the skillet, lay in an all-beef Hebrew National frank, two halves of a crab cake on one side, sliced tomatoes on the other side, pour on a small amount of cocktail sauce and sprinkle on some Old Bay seasoning. When I started designing hot dogs, I never thought hot dogs and sea food would compliment each other; but they do. Baltimore native Edgar Allen Poe may have been manic, but this dog will have you cRaven another (get it? Craven? It has Raven in it? Tell me you get it). 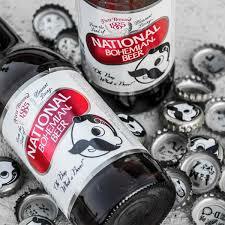 Beer Pairing: If it's Baltimore we are talking about (and it is), it has to be a National Bohemian. Natty Bo, as it is known locally, is brewed in Baltimore and is a crisp and clean beer that the Sponge Bob will soak up nicely. New York; the city that never sleeps. Also known as the Big Apple. Know why? Yeah, me neither. But it does play nicely at Citi Field where they raise a big apple just beyond the outfield wall after a Mets homer. 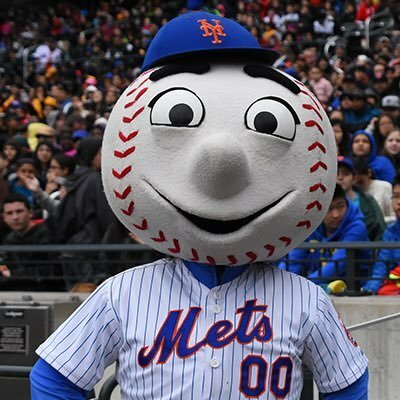 It is a mets' icon that migrated from old Shea Stadium to their newer digs. It's cool and cheesy at the same time; kinda like New York City in general. FYI, the Mets have much better food than Yankee Stadium, which is why I put a lot of thought into designing a hot dog for the team. Plus they have Mr. Met, that dude with the huge baseball for a head; I couldn't let him down. Which is why I have come up with a dog called...are you ready?....The Big Apple. Unique no? Start with a regular grilled hot dog bun. 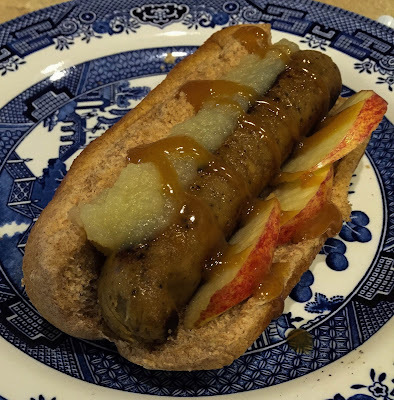 This time, instead of going with a meat dog, use a Field Roast brand of apple smoked veggie sausage. Since we are closing in on the end of the Virtual Baseball Tour, I thought I'd give you and your cholesterol a break from the meat. Add sliced apples, a row of apple sauce and drizzle on caramel sauce (you know, like caramel apples). The sweetness of the apples and the fake meat taste pretty well together. Trust me on this. Beer pairing: what better with a sweet dog than a cream ale? 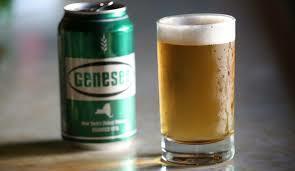 Genesee Cream Ale is brewed in Rochester and widely available in most regions. Who has the newest ballpark in MLB? That would be the Miami Marlins. If you want to catch a game, head to the Little Cuba section of town and look for the giant white, modern structure that looks like anything other than a ballpark. Trust me, they actually play baseball inside. They do things a little different in Miami. The teams namesake is, of course, a really big fish. And that is how I determined to name the hot dog designed for Miami's team: The Big Fish Dog. Start with slightly grilling a regular hot dog bun, slap down a Hebrew National frank, top with canned tuna, squirt on some chipolte mayo, then sprinkle on some chives. Eat, enjoy and watch the Marlins on your tube. I would have used grilled marlin instead of tuna, but if you have ever priced marlin from a fish market, you know why. I want you to be able to make this hot dog without having to sell your car. Beer paring: with relations between Cuba and the US warming up, it won't be long before you can enjoy a Cuban-brewed beer while downing the Big Fish Dog. 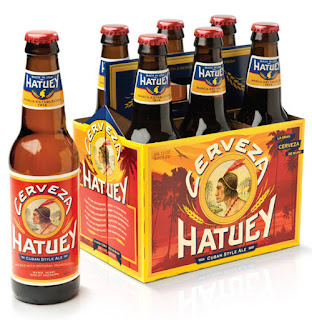 Until then, Indian Head Brewery in Maryland brews a beer once produced in Cuba. 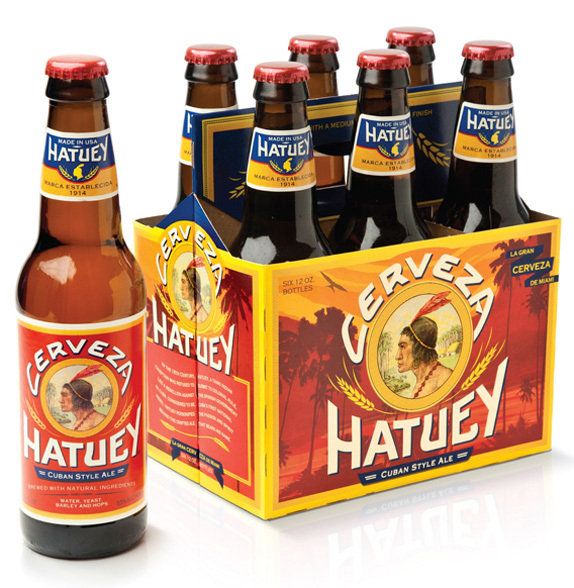 Hatuey Beer is readily available in Florida and New York; home of huge pockets of Cubans. Insist that your local beer distributor order you a few six-packs. Tell him it is in the best interest of international relations...and a hot dog emergency. Give him my number if he needs convincing. I know people.